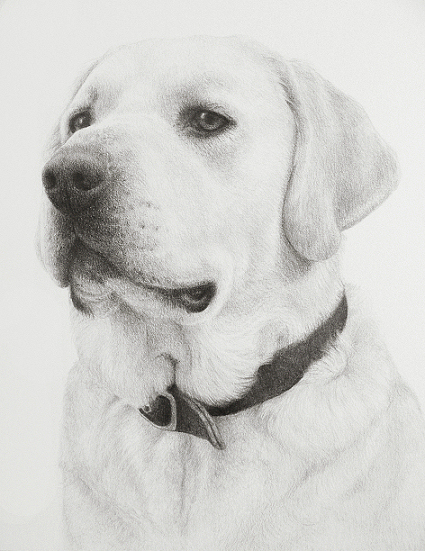 Photographs, drawings, paintings, colorings of our beloved animals, we proudly hang pet art in the office. The pieces remind us of the beauty we can forget when one of the pups pretends to be a garbage inspector: “You were seriously thinking of throwing this out?” If your walls lack an animal’s touch, consider a few of these artists’ works. 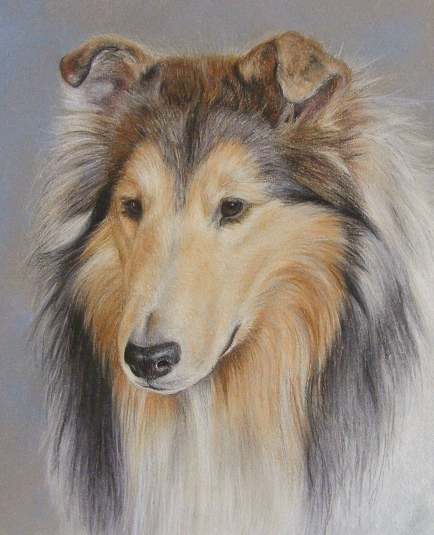 “Custom pet portraits in pastel, graphite and coloured pencil,” as the site states. Katrina shows a range of finished and unfinished cat and dog portraits, some colored, others black and white. We love several of them. The colors in the collie she posted on May 29 pop and give the picture life, but we also like the way her portrait “Bear” uses black and white to freeze the dog’s curious expression. You can visit her website for more portraits. Martindale enjoys both domestic and wild animals, which she shows through the pieces she creates with pastels, watercolors, acrylics, and other materials; the painting “I promise to be good!” is a favorite. On the blog side, she regularly updates her progress on current projects, and one of her latest endeavors was a commission to paint horse troughs. They capture wilderness scenes of dogs and foxes and horses, and they look spectacular. Maybe she could paint your dream doghouse. Like the previous artist, Martindale uses a blog and website to showcase her art. Dawn’s style deviates from the realism of the first two artists. She utilizes digital programs to draw her pieces and many make you wonder if they are from animated movies. See the piece “Chasing Dragonflies” for an excellent example. She uses pit bulls as subjects for several of her drawings, which is no surprise since she says she has a “strong love” for them. She is a younger artist, and we look forward to watching her art evolve with age. Be sure to drop by her “Go Puppy! Art” section for an instant smile. Ms. Marshall has a knack for realism, too. Various paintings appear photo-like, such as the picture accompanying this write-up. 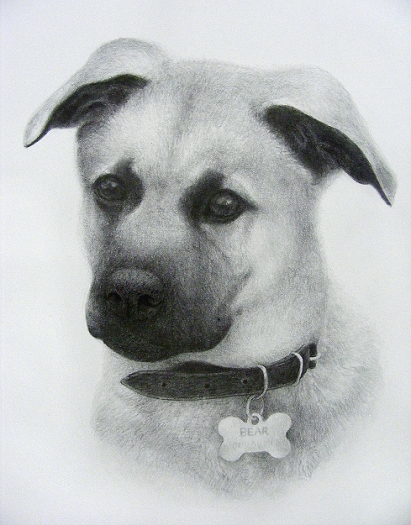 She is currently working on 101 dog portraits, and you can track her progress on her blog. 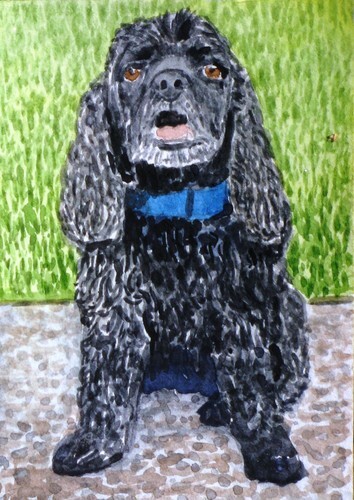 One of our favorites is a watercolor of Frodo, a black cocker spaniel, that is not unrealistic, but uses a vivid color palette that grabs the eye. Her website showcases other completed projects, such as greeting cards and postcards. A relatively new blog (created in November of ’11) for a seasoned artist. The blog is an incredible showcase of Mr. Boddum’s art, as well as his artistic process that includes interviews and looks into his studio life. Primarily focused on animal portraits, he also does abstracts and portraits of people. Many of the portraits are positioned on unique backgrounds of specific colors to help the subjects stand out. If you have not heard of Mr. Boddum, click the link to his blog and enjoy. Drawings so realist you’ll think you’re looking at a photograph. Apologies for the cliché, but his art epitomizes the statement. He has an affinity for cats, but his subjects include humans and other animals as well. You can see his work on his website, but a better experience is his Facebook page; he includes photo updates of his current projects, so you can get a sense for, and be amazed by, his process. Know more artists we should share with our readers? Tell us here, on Twitter, or Facebook. Thanks to Dog Files for bringing the story of “The Man with the Sleeping Dog” to our attention. We posted a link to the article on Twitter and Facebook yesterday, and today we’ve decided to post it on the blog. Click here to read the article. It really is a story we couldn’t pass without sharing. The love and loyalty it expresses should be talked about, barked about, meowed about, squawked about, or communicated about in whichever language is your preferred. Frank Lloyd Wright designed a doghouse. It looks like this. It leaked when it rained, but the idea of a doghouse designed by a famous architect got us thinking about the imaginative doghouses we would like to build. Designed after the van from Scooby Doo, this miniature version of the teal and green vehicle is sans wheels and glass windows. The entrance is a two-way swinging back door. While there are no glass windows, there are still window cut-outs, so a pooch can stick his head out of them and pretend he’s cruising. Blow on his face to contribute to the fantasy. Of course, shag carpeting bedecks the floor and the gas tank is really a reservoir for doggy snacks. A home for the pooch born to wear flannels. The front and back doors are plexiglass and swing. The front porch with veranda makes a wonderful spot for the pup to sit and relax during rainy weather. A faux-stump outside has two indentations for water and food bowls. The chimney is for aesthetics only. Your dog tells you when it’s time for a walk, when it’s time for a treat, when it’s time for play, and when it’s time to get out of bed. You may as well advertise who runs your yard with a small scale White House shelter. East and West Wing, North and South Portico, each side requires an entrance to make it easily accessible and welcoming; a dog president should always be approachable. A little security doesn’t hurt, however, so add secret service gnomes to each entrance. A fountain on the north or south side and a flag waving your dog’s colors atop the building are other nice additions. Does your pooch attack flying insects like she’s trying to slay dragons? This doghouse has her in mind. The front gate is always down and stretched across a small moat dug around the house. Rubber ducks or her favorite toys float around the castle. Spires in each corner, three for aesthetics, and a larger one with steps for her to reach the roofed tower, if she wants to relax on top or guard over the grounds. We’re not entirely sure how to make this one a reality, except for the standard red exterior part, so we’re open to suggestions. The interior is somewhat mysterious and much larger than the exterior. It has multiple rooms, and whenever Snoopy goes inside, he always comes out with what he needs, be it an umbrella or Christmas lights. Sitting on top of the doghouse makes it double as a WWI fighter plane. We would love to see our dogs pretending to dogfight with Snoopy’s arch-enemy, the Red Baron. Let us know the type of doghouse you would like for your dog in the comments, on Twitter, or Facebook. Woof.